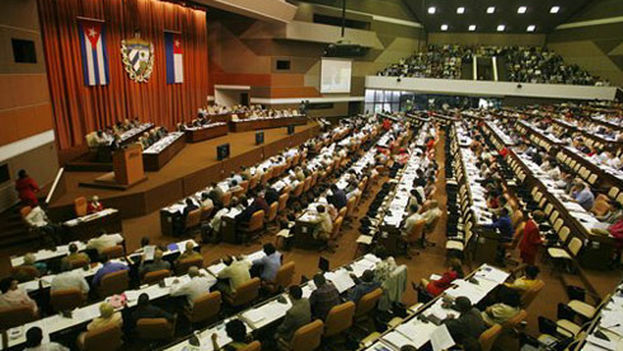 After the Tenth Assembly of the Central Committee (CC) of the Communist Party of Cuba (PCC) the news about the next “enactment of a new electoral law; and the subsequent holding of general elections” has begun to circulate in the official media. Such an important announcement in a country where, for more than 60 years ago no general election has taken place, is mentioned almost tangentially, just nine words in an informational note on the above Assembly, whose “focal point” had to do with issues related to the preparations for the celebration of the April 2016 Sixth Congress of the single party. So this is how the casual style of the announcement turns out so very misleading, downplaying a code whose nature would be essential in any minimally democratic society. It is unknown what motivates this renewal of the law in a country whose government, until recently, boasted of having the most fair, transparent and participatory electoral process in the world, able to summon an overwhelming majority of voters to the polls. The case provokes many questions, some very basic: Why change a law that is supposedly a paradigm of democracy even for the most civilized nations on the planet? Why does the proposal arise from the central committee and not from the higher authorities of the People’s Power, as might be expected? What reason is there for the urgency in enacting a new Electoral Law? Once again, we only have speculation in the face of official secrecy and conspiracy. In fact, this time they have not announced the completion of an extensive process of “popular consultation”, though it was conducted – at least in a formal manner — for several months in 2013, before the creation of the new Work Code currently in effect. The time span between the April 2015 “partial elections” and the enactment of the new Electoral Law was not clearly established either, though judging from the official information that was disclosed we can assume it will be brief. In principle, the announcement has accomplished the government’s purpose: to not awaken dangerous expectations among Cubans, especially after the wave of enthusiasm that seized many with the December 17th announcement about the restoration of relations between Cuba and the U.S. In that vein, subsequent statements by the General-President during the last meeting of CELAC cooled the wildest fires, and, at the same time, they have widened the gap between the Government and citizens. No doubt that the olive green tower has proven that the hope for effective changes for Cubans focuses more in the future steps of the “enemy” government than in the “actualization of the model” endorsed by mediocre Raulista reforms. The Revolution has become a succession of failures, and today the old Sierra Maestra combatants and their side troops sense that the smallest of openings could end in a loss of control. It is fair to say that the fears of those in power are well founded. Wouldn’t it be right to expect that the multiparty system requirements or, at least, a strong controversy about the one-party system would emerge from an extensive debate by Cuban society? Are we not in a favorable scenario for claiming genuine democratic participation and transparent general elections to replace the electoral farce practiced for the past 40 years? Obviously, the elderly leaders will not want to take too many risks. For now, it seems impossible to imagine what “new” democratic clauses the same dictatorship that has dominated life and property for 56 years has in store for us. In any case, the sacred scriptures say that you cannot pour new wine into old wineskins. Everything indicates that the new electoral law will yet another plot of the power and its claque, just a hasty move to bolster up the makeup that minimally covers the dictatorial nature of the regime, and to silence the scruples and demands of the nations gathered at the Americas Summit this fast approaching April. Presumably, the olive green cohort – who might do away with uniforms and decorations and dress impeccably in civil garb for the occasion — will brag about the partial election results and offer the new electoral code as irrefutable proof of his willingness to change and his democratic calling. If it weren’t so twisted, such a pathetic pantomime would be laughable. However, we could be facing a dangerous move here that would entail a high cost for the democratic aspirations of the Cuban people. Civic orphan-hood and generalized apathy are the best cards the Havana regime is counting on. It is urgent that public opinion be alerted about a possible ploy that – in the style of “eternal socialism” style — would only want to artificially postpone the end of the most persistent and pernicious dictatorship of the many that have blossomed in this Hemisphere.